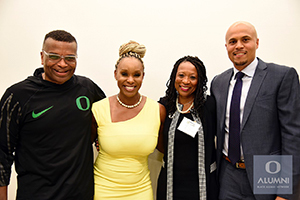 When the University of Oregon held its first-ever Black Alumni Reunion this October, Ericka Warren ’92, MBA ’19, was leading the action. Whether it was the groundbreaking for the university’s new Black Cultural Center, a speed-networking event for returning alumni to meet current students, the stirring lecture from CNN analyst Angela Rye, or the weekend’s Soul Sunday Brunch, Warren was there—and led the team that made it happen. The weekend was a resounding success. But if Warren had to pick what stood out most, she’d choose the moments when she saw the reaction of the UO’s current black students to the return of approximately 150 black alumni. “Right now the population of black students on campus is about two percent, which has been fairly consistent over the past 30 years or so. So to see the positive reaction of students coming in contact with people who look like them en masse was a wonderful feeling,” said Warren. Taken together, the reunion and its associated events represented a significant milestone in a journey that started for Warren around five years ago when her former classmate Derrick Deadwiler ’94—who at the time was serving as president of the UO’s national alumni board—came to her with the idea of starting an official affinity group for black alumni. Warren worked with the University of Oregon Alumni Association to establish the Black Alumni Network and was elected the chapter’s first president. Months later, she was accepted into the Oregon Executive MBA, the UO’s Portland-based graduate business program designed for experienced professionals. The UO Black Alumni Network was established to reconnect black alumni to the university, provide opportunities to grow personal and professional networks, provide support for current black students through mentorship and endowment of scholarships, support the UO's efforts to recruit and retain a diverse faculty, staff, and student population, and celebrate the rich history and accomplishments of black UO students. The chapter’s first task in its overall strategy to connect alumni back to the UO was to begin planning the reunion. “We thought having a reunion where people could reconnect with their friends and see what's happening at the campus would be a great starting point for promoting membership and geting buy-in to some of the initiatives that we have,” said Warren. At around the same time as the newly founded alumni chapter began planning the inaugural reunion, student members of the campus’s Black Student Task Force met with administration and presented a list of demands urging them to address issues of race to create a healthy, positive climate on campus. One of the items was that the UO build a Black Cultural Center. The idea of a dedicated center had roots stretching back a half century to 1968 when the Black Student Union protested and also presented a list of demands surrounding the same issues. 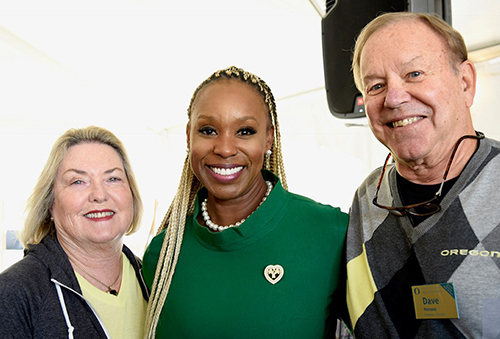 Timed to coincide with the Black Alumni Reunion, the groundbreaking of the new cultural center became a central feature of the weekend’s events. Warren is quick to make clear that the center isn’t intended to exclude others. The goal instead is to celebrate the richness of black culture and provide black students with a supportive home base from which to explore everything the university has to offer. At the same time, the center will be a place for students with other backgrounds to deepen their connection to this vibrant part of the Duck community. For Warren, the reunion is a high point in a professional life already filled with accomplishments. After graduating from the UO, where she majored in East Asian studies, she toured the world as a vocalist with a number of well-known musical acts. It was during this time that she learned she had an interest in—and a distinct flair for—business. “While I was on the road, I kind of got thrown into the business side out of necessity. Though I was writing and producing, I also found myself having to assist in negotiating contracts, creating marketing strategies, handling the finance for music and film production, and that sort of thing," said Warren. “I just kind of had to learn on the fly by reading and talking to people. I think because I was well spoken, people had no idea I didn't quite know what I was doing,” said Warren. When she returned to Portland to raise her daughter, Warren found a new use for her business skills: running the business side of a family-owned chiropractor practice. Seeking to continue elevating her business skills, Warren decided to pursue an MBA. The UO’s Portland-based Oregon Executive MBA program was an easy choice for the dedicated Duck. The program’s convenient twice-a-month schedule and the high level of professional accomplishment of its students sealed the deal. Because Warren’s time at the Oregon Executive MBA has overlapped with much of her work for the Black Alumni Network, she’s been able to take what she’s learning in the program and apply it immediately to a project that means so much to her. Warren has also benefited from the talent she’s found in her fellow students. When a board member was unable to continue participating in the reunion planning, Warren tapped the talents of classmate Domonique Debnam, MBA ’19, who ended up playing a significant role in the weekend’s events, assisting Warren in such areas as marketing, public relations, and professional recruitment. The October reunion was just the start for Warren and the Black Alumni Network. Warren’s future goals include finding ways to develop the Black Cultural Center’s financial sustainability and launching a mentorship program pairing black alumni and current students. To help ensure that this vision becomes a reality, Warren has made the Black Cultural Center the focus of her capstone project, the in-depth undertaking that challenges Oregon Executive MBA students to bring together everything they learned to create a strategic business plan for themselves, their organizations, or a cause they care about. Given her passion, creativity, and what she’s accomplished so far, the chances are good that Warren will continue to make a lasting difference for generations of UO students.